As many readers of Black Gate no doubt know by now, I have previously reviewed the shared-universe anthologies Lawyers in Hell, Rogues in Hell and Dreamers in Hell, all edited by Janet Morris and Chris Morris. 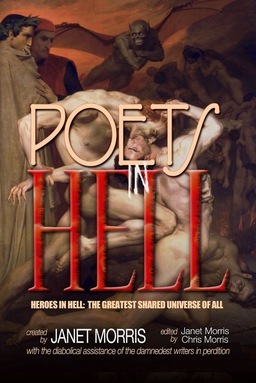 Well, this time out, with Janet’s help, I am going to do something a little different for Poets in Hell, the 17th volume in the highly-acclaimed, award-winning, and very successful Heroes in Hell (HIH)series, what I like to call The Eternal Infernal Saga. Let me first give you a little back story, a little history as to how I, unplanned and undreamed, found myself wandering through the circles and levels of Hell. A couple years ago I was asked by my friend and fellow author, Bruce Durham, if I would write a review for the then-newest volume in the Heroes in Hell series, Rogues in Hell. I said sure, I’d be happy to, even though I was in the middle of writing my second novel. 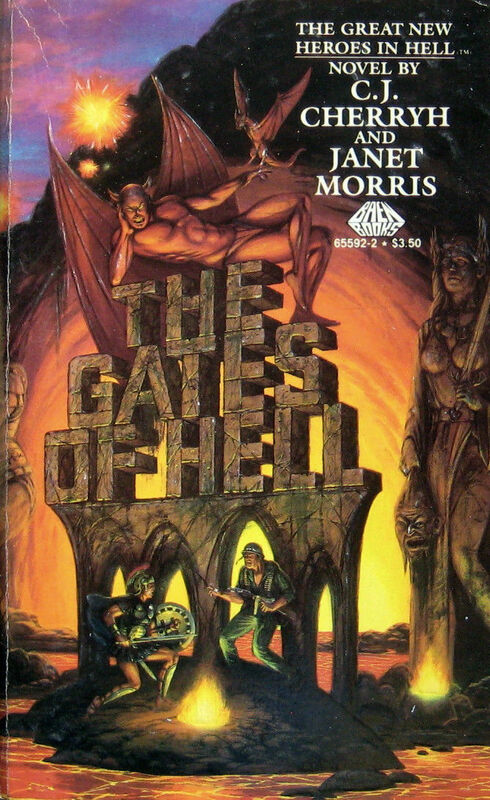 I remembered the original Baen Books Heroes and Hell series, having enjoyed a number of those, and I was familiar with Janet Morris from her work in Thieves World™ and many of her own novels. But it had been years since I read those; and I’d been so long away from the fantasy genre that I had no idea that Heroes in Hell had continued on past the 4 or 5 volumes I had read in the 1980s and early 90s. 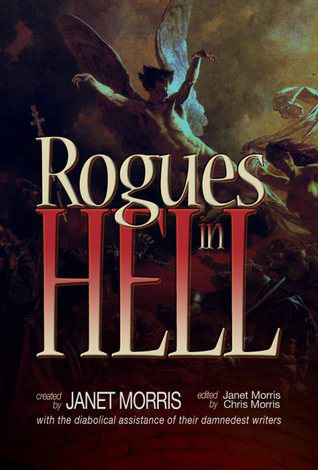 So I read Rogues in Hell, loved every word of it, wrote my review, and then bought the previous and first volume in the new, 21st century series now published by Perseid Press, Lawyers in Hell. Now, while lost somewhere deep in the nether regions, I get contacted one fine day by none other than Janet Morris herself, who read my review, was very pleased with it, and liked the way I wrote it. She then read my story of Dorgo the Dowser, “The Moonstones of Sor Lunarum” that I had posted on Black Gate, liked it, read more of the Dowser’s stories in my Mad Shadows: The Weird Tales of Dorgo the Dowser, and invited me to write a story for the then-forthcomingDreamers in Hell. To say that I was excited, flattered and a little intimidated would be understating it all. I was totallyoverwhelmed! Naturally, I said I would love to give it a try. But I waited. I bided my time. 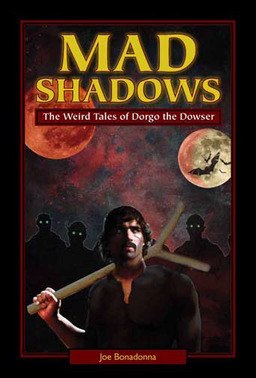 What I wanted to do first was read and write a review of Dreamers in Hell, and then go back to re-read the first few Baen Books editions and read some of the stories in the other volumes, the ones I had not read. Another year goes by and I still haven’t written a word. But I was in constant touch with Janet and her Hellions, as her band of Hell writers call themselves, and thoughts and ideas began to flow. 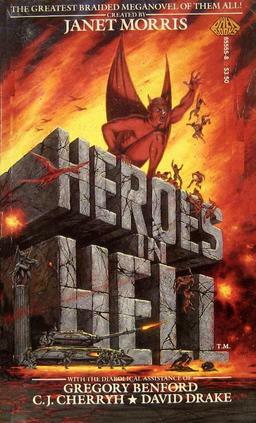 First, writing for Heroes in Hell is hard work: one needs to do a lot of research, because most of the characters in this Miltonian shared-universe are historical figures, figures of myth and legend, Biblical figures, and even some famous fictional characters – provided some link to an actual person can be found, such as the Dracula and Vlad Tepes connection. So I hunkered down and did my homework, reading some history and biographies, researching things like demons, devils, angels, fallen angels, and the Hells of different cultures and religions. Not only was I developing a story, I was getting a wonderful education. Now, the second thing about writing for Hell is that it made me “up my game.” The series is not only character-driven, it is allegorical, dramatic, poignant, high comedy and grim tragedy; it runs the gamut of genres and emotions. I was playing in the same park with some damned fine writers of imaginative literature, and something in the infernal nature of Hell demands and commands a writer to do the best he can, to go above and beyond what he/she has done before. Hell is addictive. It’s an obsession. Hell has its rules, but what the rules do is force you to be more creative, to think outside the box: the rules are not restrictive, they are liberating. Once you pick your characters and start your research, you find things, you learn things you can use to make those characters live and breathe and jump off the page. Yeah, writing for Hell is hard work, but it’s also one helluva good time. I love every moment I spend in Hell – and I spend a lot of time there. 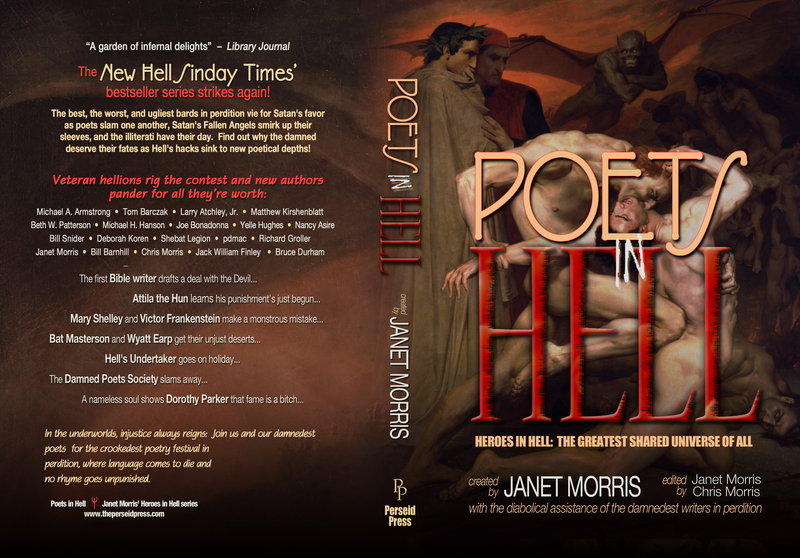 So what Janet and I thought we’d do this time out is give you an overview of Poets in Hell, a synopsis of each story, in the words of the authors themselves. Enjoy! 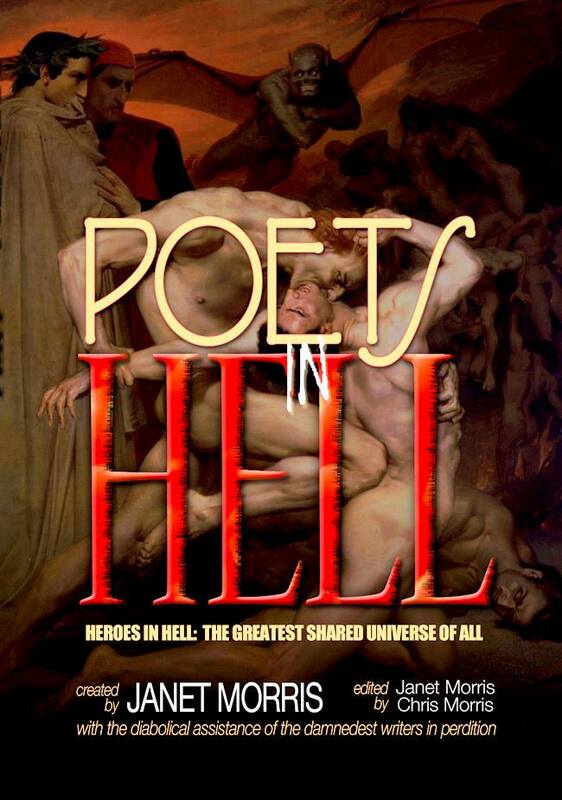 And there you have it, Poets in Hell. A little something for everyone: heroic fantasy and sword & sorcery, thrillers, horror, romance, touches of science fiction and steampunk – they’re all here. So come visit us in Hell and enjoy the company. 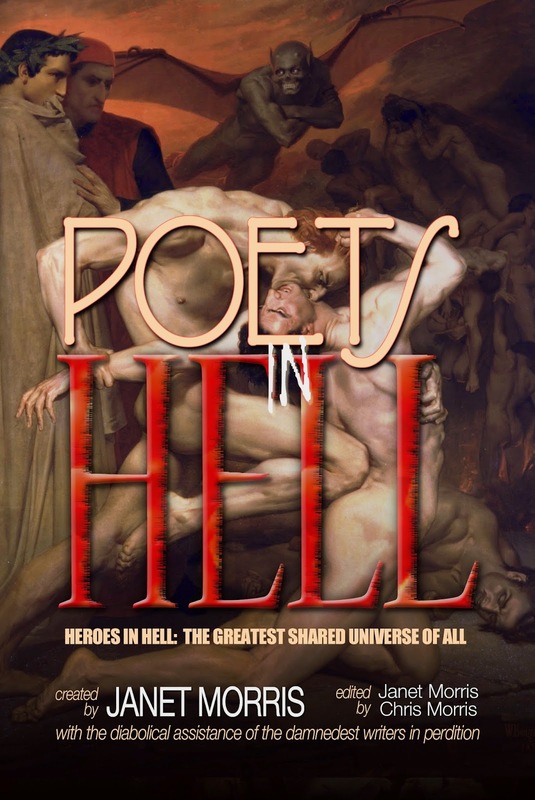 Putting together volumes for the Heroes in Hell (HIH) shared-universe series is always hellish: writers fall ill, die, come into the series or leave it; new writers bring chaos among their bags of tricks, reinterpret every rule, demand exceptions to guidelines, and generally run amok. My co-editor Chris Morris and I like that: running roughshod over complacency keeps Hell popping. We ourselves became seduced into reopening the series by a writer no longer among us, who suggested that if we did a secret page on FaceBook, the creation process would be easier to manage. Easier? Not at all. More intimate, for certain. 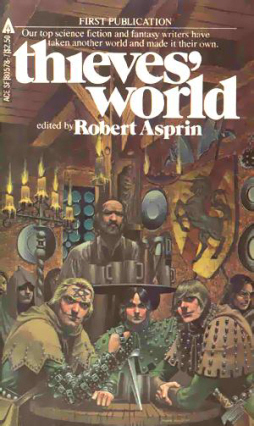 In the 20th century, I (Janet) and my co-editor Chris, became part of the first sword & sorcery shared universe, Thieves’ World: its mission was to make sword & sorcery and fantasy darker in a place Bob Asprin, series creator, called “the armpit of fantasy.” Little did any of us know that the TW series would make fantasy history – and help turn the genre very much darker. Taking Bob at his word, a great time was had by all in TW. Or at least by me and Chris. The stories of Tempus and his Sacred Band grew into the Sacred Band of Stepsons series, and gave me three Science Fiction Book Club selections (Beyond Sanctuary, Beyond the Veil, and Beyond Wizardwall, all previously reviewed here on Black Gate in their Perseid Author’s Cut editions). So Chris and I decided to do our own shared universe: since art imitates life, we thought we’d write it in Hell. Remember those murky days of the late 20th century: no internet; no fax machines; no competing phone companies; computers that used floppy disks; author royalties of 10%? Communications were expensive and slow. Nevertheless, we created the Heroes in Hell shared universe under a multi-volume contract with Jim Baen, and raise hell we did, in twelve volumes for Baen Books. Doing HIH collaborations in real time would be much better, right? Lead to tighter plots, more alliances within the writing team and more friendly competition, resulting in better cohesion and at last in better stories? Of course it would. So we agreed, and this idea of intimate expansion of our franchise due to interaction evolved into the Heroes in Hell Working Group, where writers ask questions, provide answers, share data, request characters and submit synopses, get permission to write those synopses into stories, post snippets of stories and rough drafts and— here it comes; wait for it — make deals with one another to share characters and hand off plot points. Chris and I would give them long, medium, and short series- and volume- oriented story arcs, and off we would go. No sweat. No harm. And I could limit the fouls. And it worked out that way, and continues to do so, except when Satan takes a hand, or any of the other gods and judges in Hell decide to meddle. The most-snake bit volume in 21st century HIH has been Poets in Hell (PIH). Sounds innocuous, doesn’t it? It wasn’t. It isn’t. HIH as a matter of pride tries to introduce new writers, mix experienced professionals with emerging talents and first-time authors. The writers, as we discussed future volume titles in the working group, wanted desperately to do Poets in Hell. I knew it was coming. 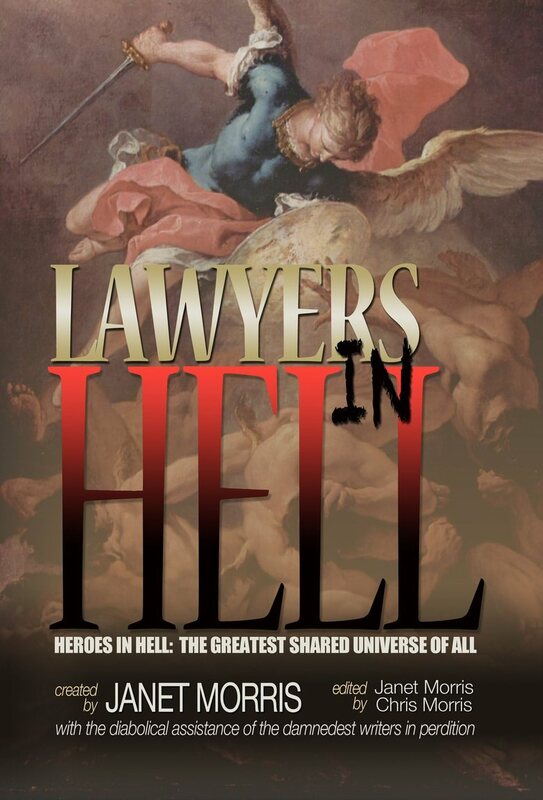 I had already posited in Lawyers in Hell that the powers Above were sending auditors to the underworlds because Hell wasn’t sufficiently hellish. Enter Erra the Babylonian plague god and his Sibitti, personified weapons and cruel enforcers of Heaven’s will: this multi-volume arc remains in play to this day. I had time to introduce Will Shakespeare and Kit Marlowe and Lord Byron in Rogues in Hell. 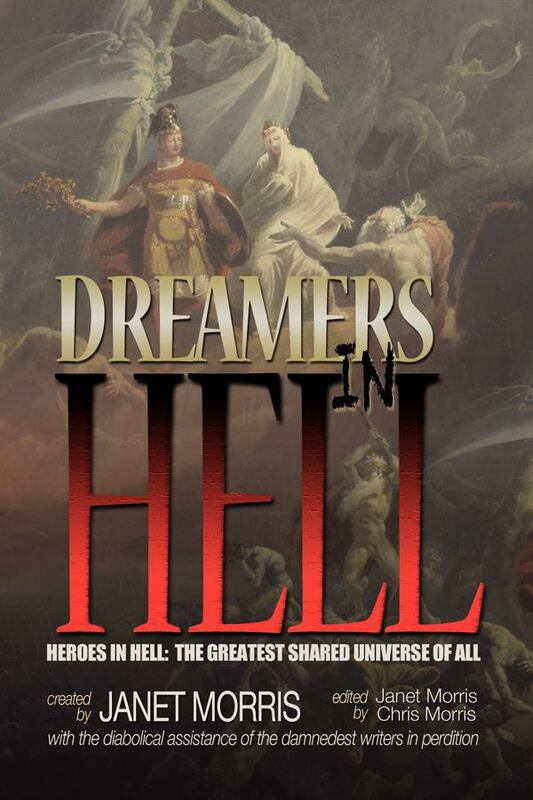 I expanded their roles in Dreamers in Hell, writing from Satan’s perspective to make sure His Infernal Majesty (HIM) seeded the story arcs and foreshadowed the tensions needed for Poets. Then in Poets in Hell we turn them loose; Byron even brings his faithful dog, Boatswain. For my part, I recruited new writers, to keep things fresh. Then, of course, all hell breaks loose. Some new writers decide to team up with more seasoned writers and with other newbies, but are inexperienced at fictional hand-offs, requiring Chris and me to take a hand and give crash courses. Writers submit stories with quotations and paraphrases, without annotating which are which. Every line of poetry must be checked and double checked, to make sure they’re attributed in situ if need be. The copy-edit alone was worthy of a dissertation. My experienced Hellions, who asked for this volume, reached for the skies in their story purports and executions. The new writers performed Herculean feats to stay in the game. This would be the best volume from HIH ever, I thought, if Chris and I could get it under control. Every so often life hands you a snake-bit project, but PIH was plagued with gremlins worse than snake-bite, unless the snake was from the World Tree. My editorial assistant broke her wrist, had a near-fatal heart attack, was comatose, and then out of commission for weeks; one of my long-time writers was diagnosed as terminal and began chemotherapy; another had an impromptu pacemaker installed after an emergency helicopter ride. Several experienced Hellions couldn’t submit within the time frame. I drafted Joe Bonadonna to help me with the copy-edits once we finally received all the stories. So, we’re tracking, headed toward our deadline. But someone sends in a final draft with a virus, and when we combine the stories all the final drafts become infected. Never mind. We’ll have each story resubmitted. We’ll find a new formatter, a new copy-editor, a new up-loader…. We’ll get our intrepid assistant a new computer. Multiple struggles with the snake-bit (intransigent) epub and mobi manuscripts reveal hidden codes that must be sleuthed out and eradicated. The cover designer goes incommunicado between her rough draft and final revisions, leaving me with a cover half-finished. We don’t get a final cover until the day the Kindle is scheduled to be uploaded. Nevertheless, there’s good news: although the works are extremely sophisticated, the volume reads like a mix of sword and sorcery and darkest fantasy; we were able to employ cover art I’d wanted to use since the first volume; one of writers wrote the scene on the cover into his story. For the first time, Chris and I wait until nearly deadline, when all other stories are submitted, before we write ours. Usually we give the writers “frame” stories: the first and last stories in the book. Quite reasonably, given the nature of poets, we didn’t do that this time: We’d make them perform without a net because we wanted a wilder result. Well, I’d better not tell you that. I’ll just say that Satan had his way with all of us, this time around. Next time, we’re doing Doctors in Hell. That surely will be easier. In the 21st century, the new Heroes in Hell volumes preceding Poets are: Lawyers in Hell, Rogues in Hell, Dreamers in Hell. Get them all in trade, or for Nook or Kindle.